Treasure and danger await in the depths of the Earth. Will you dare enter the Dungeon? 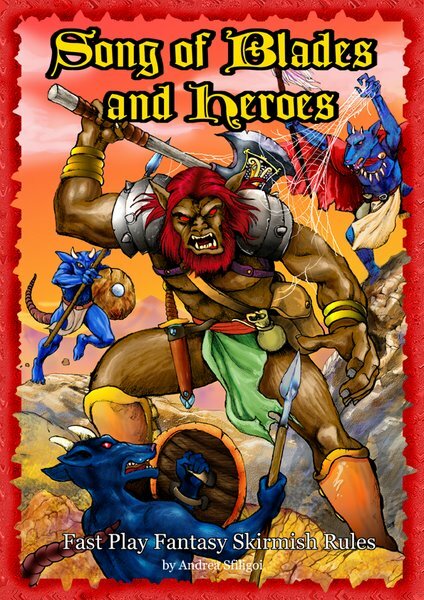 Song of Gold and Darkness is the first expansion for the Song of Blades and Heroes fantasy skirmish rules. It includes complete rules for dungeon adventuring such as: Rules clarifications and expansions; 11 new Terrain types; 18 new Special rules for your models; four new warband advances; Necromancers, Sorcerers and Summoners; rules for treasure, climbing, bashing down doors, lock picking, traps, light and darkness, movement and combat; potions, magic clothes, magic weapons and jewelry; four dungeon scenarios; guidelines for solo dungeons; rosters for 156 new monsters and warriors, including Dark Dwarves, Dark Elves, Hobgoblins, Snakemen, Giants, Angels, Demons, Were Creatures, and classic dungeon dwellers such as Brain Devourers, Eye Monsters and Gargoyles. Song of Gold and Darkness will be available as emailware on September 5th for $8.